The first thing you will notice is its new and fresh look. 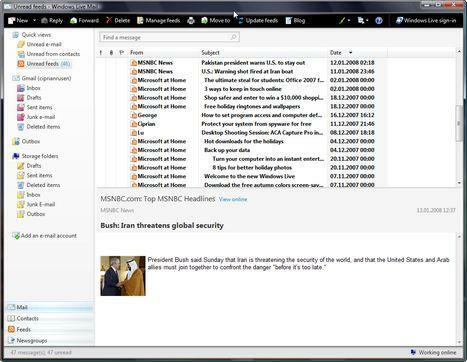 For an e-mail client, Windows Live Mail has a pretty slick look and integrates very well with both Windows Vista and Windows Live. If you don't like the default look or you get bored with it, you can easily change it at anytime and have Windows Live Mail look the way you want to. It takes only two clicks to do it. Another positive thing about this aspect is the fact that users can easily change layouts and use the one that best suits their needs. The interface is very minimalistic: you have a small number of buttons which cover only the basic actions and configuration options. 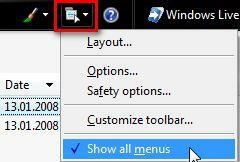 Just like in the latest version of Windows Explorer, the menus are hidden by default. To activate them you will have to check the 'Show all menus' as shown in the screenshot below. Configuring Windows Live Mail is very easy, especially if you have worked with Windows Mail or Outlook Express. Most of the configuration options are found in the same menus, so no surprises there. One feature that was appreciated by our readers in Outlook Express is the possibility to work with multiple e-mail identities. Just like Windows Mail, Windows Live Mail does not offer this feature. All you can do is import or delete existing identities. Emoticons and Inline spell checking - the spell checking is always a welcome feature. The available emoticons are the ones you know from Windows Live Messenger. Even though they are not very impressive, they sure are a nice new feature. As a downside, I have noticed that some security solutions, including version 7 of Kaspersky Internet Security, do not detect Windows Live Mail as an e-mail client and do not install the spam filters; this means that the sent and received e-mail messages are not being scanned. I'm sure this will get fixed with future updates but until then it can be quite a problem if you are not very familiar with security on your computer. After working for a while with Windows Live Mail, I must say it is pretty fast and easy to use. I'm sure many of you won't have a hard time learning how to use it. Except the security problem I've mentioned, Windows Live Mail has no other major weaknesses. Even though the new features are not revolutionary, they certainly build up and create a pretty solid e-mail client which will please many users. I am enjoying using Vista on my new computer but I have a problem. In trying to access my email from other computers as I am now in Monterrey, Mexico, I am not able to pull up my old UNREAD messages. What can I do? According to their own staff, Kaspersky will never support Windows Live Mail (well, not for a long time anyway). They are only supporting Windows Mail, Thunderbird and Outlook. Apparently Windows Live Mail isn't mainstream enough for them to care yet. It's still a good program though, and easier to use than any of the other email clients. How can I remove the lines on the border of email that has been forward to me. Sometimes there are 3 or 4 lines that I would like to remove before forwarding the email. How do you make a address show only the email address rather than the persons name. Some people dont want their name identity shared. Is BCC the only way to do it. It seems maby they need listed in the contact differently. how to configure interface of windows live mail? I'm blind and am using windows xp with internet explorer and a screenreader. I thought, windows live would improve the functionality of internet explorer and outlook express. But windows live seemed to be an alternative for outlook express etc. How to configure the interface of the windows live products so that's usefull to me? Now, I can't find my mails etc. because my screenreader don't find his way. Help, please. I have lost my Toolbar/In box Bar -- Write, Reply, Reply to all, Delete, Print, etc. How can I get it back? I am haveing trouble with the size of pictures that I send over my e mail. I access attachments and when I say photos I do not have any control of what size of photo that is sent. Is their any way to redcuce the size of the photo so that it does not overload the e mail? It takes as high as 30 seconds to 60 seconds to open the compose mail box or forward mail box with windows vista. By the time, I forget for what purpose I opened the compose mail box. It is rather irritating to sit infront of the processing icon. It drags down my productivity. Can someone just help me how to make the compose option work faster on Windows mail. Anyone who give a suitable solution, Thanks for your assistance. The only feature which is useful for freelancer associated with the different groups was to save different mail ids in one account , which unfortunately is not in this mail live. Can I program windows live mail to be sent and received from the inbox in Windows Mail on Vista? If so, how is the account set up?